Prices will not increase due to higher incidence of tax and, instead, are likely to come down under the Goods and Services Tax (GST) regime, the central government said on Tuesday. "Almost 60 per cent of the income of the Centre and states comes from items that attract 14 per cent value added tax and 12.5 per cent excise duty. There will be a likely decrease in the tax on each of these items under GST," Revenue Secretary Hasmukh Adhia told reporters at a GST conclave here. Adhia said that though most services will be taxed at 18 per cent under the GST regime, as against the current 15 per cent service tax, a majority of these will get input tax credit on purchases and the overall tax incidence will remain the same. "About 18 per cent (service tax) will become equivalent to 15 percent. There will not be much of an increase in service tax. There could be a marginal increase of tax for some services," he said. "It is a possibility that there will be more than one rate for service tax. It is not necessary all services will attract 18 percent tax. Abatement will be kept in mind." "For a few services, the rate will be decided keeping in mind abatement (relief) that it attracts. For such services, rate will be less that 18 percent," Adhia added. He also said that the government will soon issue the rules concerning the provision of GST Compliance Rating for an assessee under the law. The GST Network (GSTN) system will furnish the taxpayer track record regarding the compliance level, especially about the track record related to timely uploading of supply invoices giving details about the auto reversals that have happened for invoices issued by a supplier. If a taxpayer tries to evade tax, the GSTN software will be able to detect that and downgrade the compliance rating, the Secretary added. Adhia also said the government plans to roll out GST from July 1. "Our full effort is to roll out GST from July 1 and I urge trade and industry to not be complacent," he said. 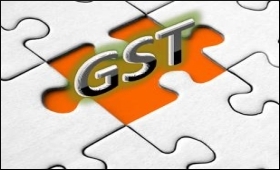 As many as 14 states have said they will pass the State GST (SGST) Bills by the middle of next month and by May-end all legislatures will have passed the SGST Bill, he added. I think it is ease of collecting tax from Janta...it will not reduce any tax... and if then plz do explain with example....?so that we can understand... it is not ease of doing business but it is burden of tax...?